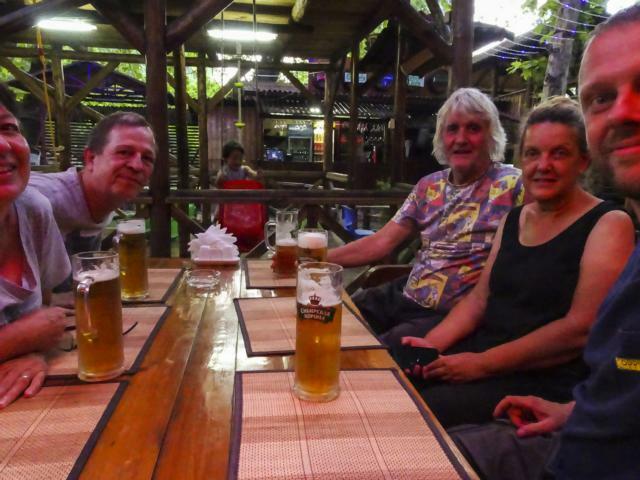 A last night in Karakol. Still in the rather nice Neofit GH – the former house of a Russian Tartar. 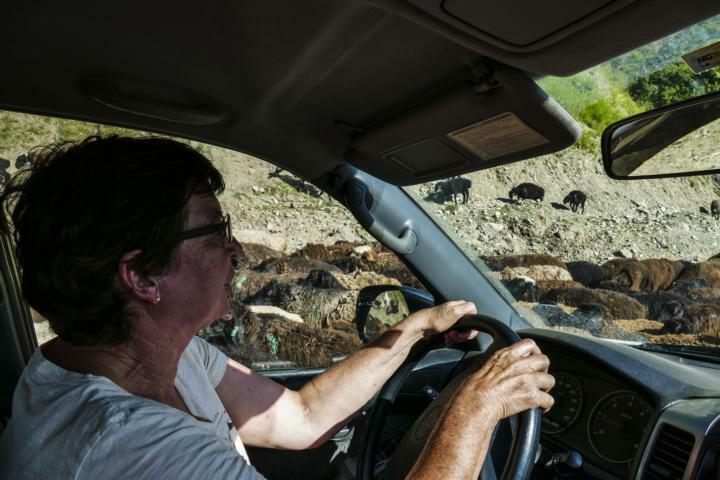 Then we’re back driving to the west, in direction of Central Kyrgyzstan. On the way we have to drive up 1 of the highest mountain passes in the country: Suök Pass at 4022m. Fortunately there’s the huge Kumtor Gold Mine nearby, so the guys digging there in the mountains maintain the road to evacuate all the gold to Swiss banks. The road starts thru a lovely valley. On the way passing the Gagarin monument – the 1st human in space the Soviets fired up to orbit in 1961 (wikki him on https://en.wikipedia.org/wiki/Yuri_Gagarin). This happened shortly after the test flight with a dog on board returned successfully to earth – only the poor dog was converted into a piece of grilled meat. Gagarin all happy to have evaded the poor dog’s destiny recovered from his space adventures in this beautiful area and got eternized in a stone monument. … then thru some nice avalanche areas and many more hairpins to the 2nd pass at 3800m. The road gets more’n’more wet’n’muddy. Now we’re back in the snow. And it’s melting. 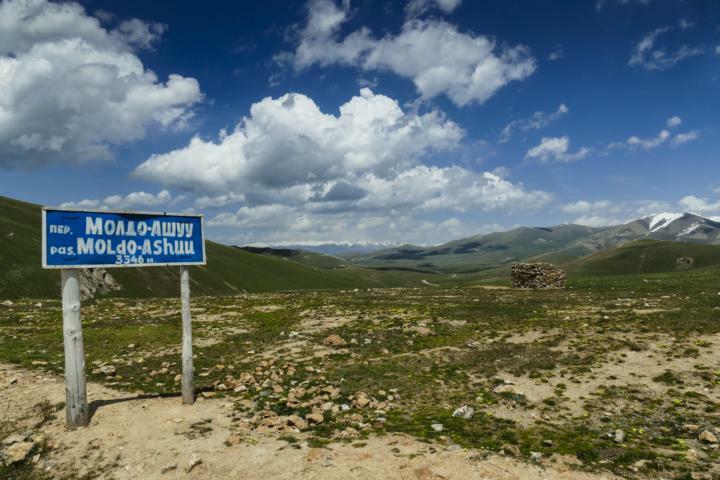 … we drive on a high plateau towards the junction to the gold mine – of course entrance and souvenir collection strictly forbidden. A few km further and a little higher we reach Suök Pass at 4022m altitude. Definitely Prado is happy it doesn’t go any further up. 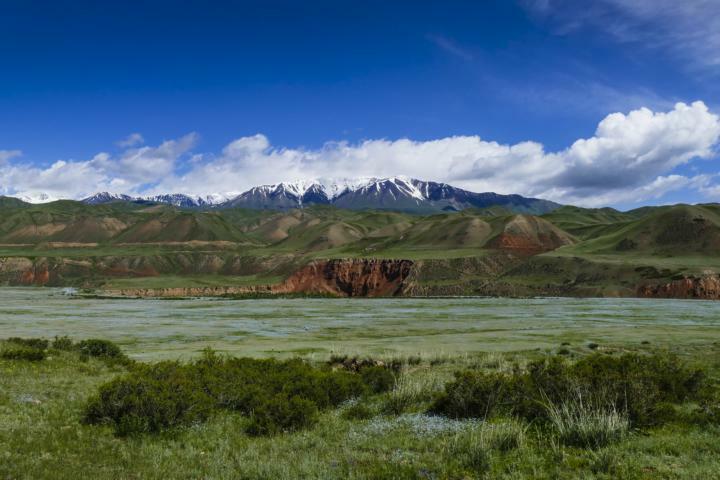 A unique chance to admire all the summits of the Central Tian Shan Mountains at the border to China. There must be 1000s, all 5000m high and even higher. Then the long way back on the muddy and slippery road. 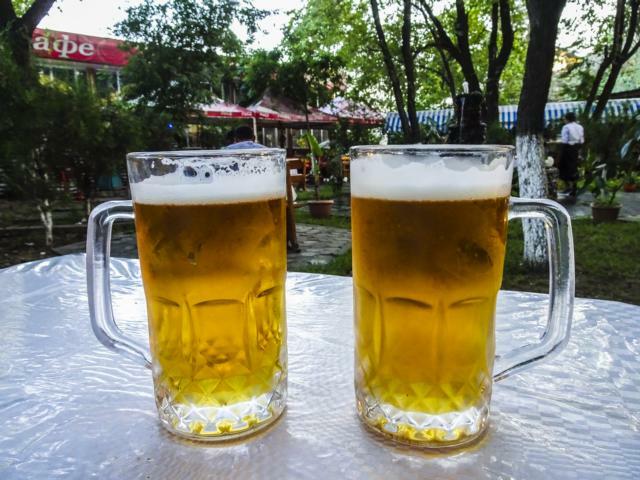 In the evening we reach the Al Hayat Art GH at the shores of Issyk Köl. We move on along Issyk Köl to its western end and further south to Kochkor. On the way a short visit to a salt lake intensively promoted in this area – a pure waste of time. 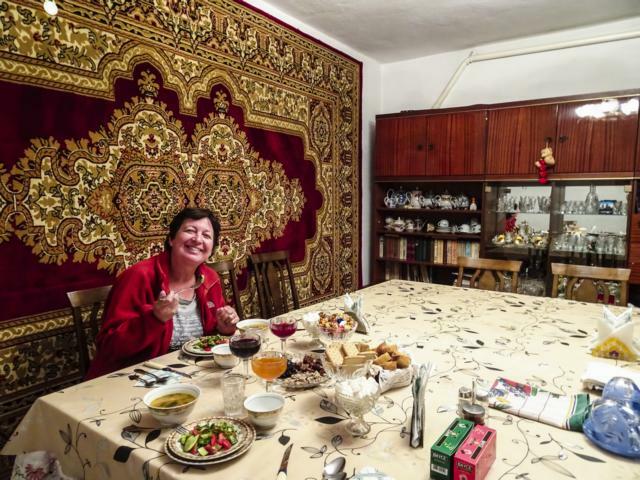 Kochkor – a small market town in the middle of nowhere. We go to Alima’s Shamen 14 GH. Nice place, some exchange of tales with a French couple on their way from Kazakhstan to France by bicycle. They’re quite happy with this way of travelling and even happier to have already done10% of the distance. … moving up to 3500m, crossing some culverts seemingly relicts of the glorious Soviet time, and the snow on both sides is getting higher’n’higher. Then over the ridge – and here it is: Son Köl, the jewel. At some distance a thunderstorm. Some 10’ were in the middle of it. Some 20’ later we’re definitely out. 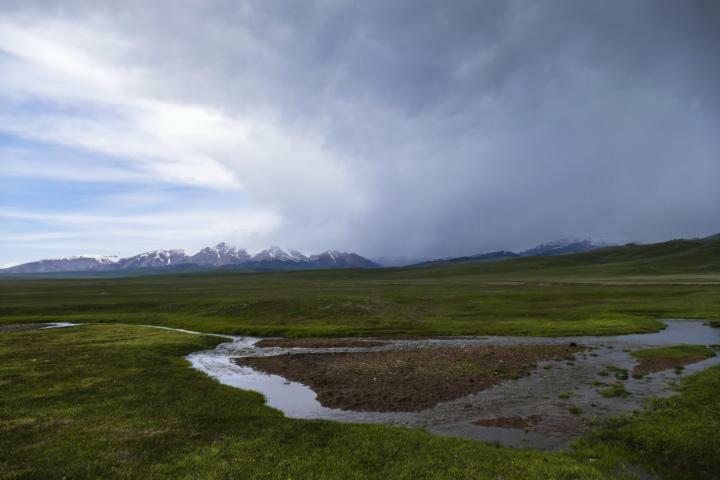 Time to admire the gentle landscape with its wide pastures with some herds, the few yurts and finally the lake. We take the road to the south over the Moldo-Ashuu Pass. 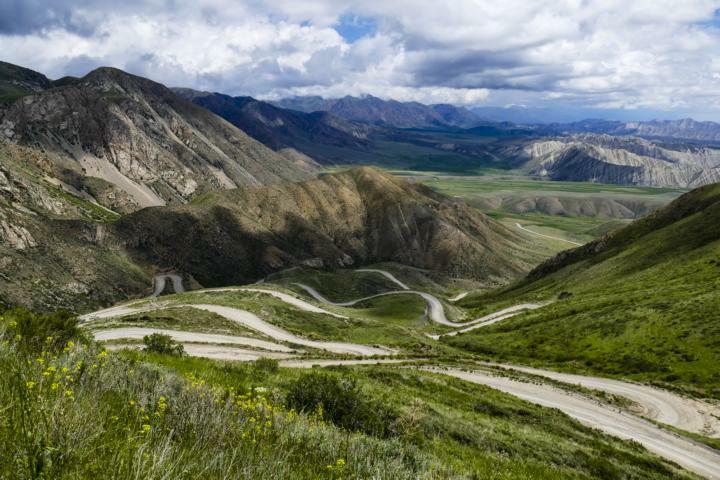 It’s famous for its hairpins winding down from 3300m to some 2000m in the Naryn Valley. We stay in Naryn. Maybe not the most appealing town in the world; nevertheless a place to explore the sad destiny of some Soviet heritage. For details of these super sights please press the button. The next day into the Kichi Naryn Valley. 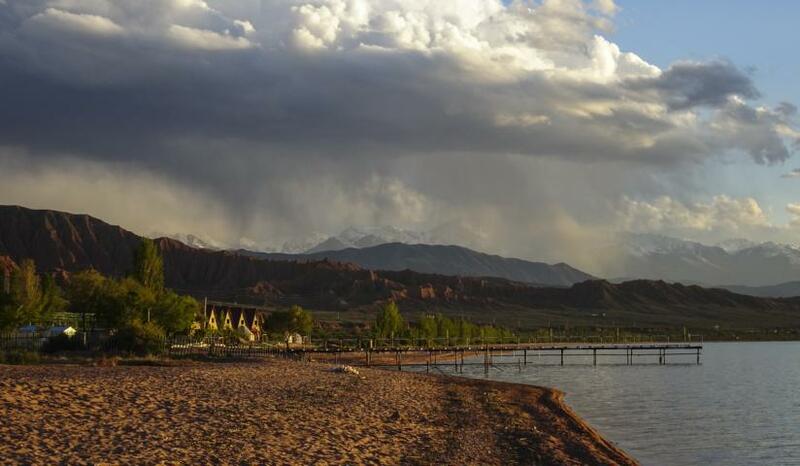 Some claim it the most sensational landscape in Kyrgyzstan. Well, we think it’s a nice drive far off the main tourist road but definitely not the most spectacular place in the country. Definitely there are some spectacular bridges. You’re definitely happy once you’re on the other side. 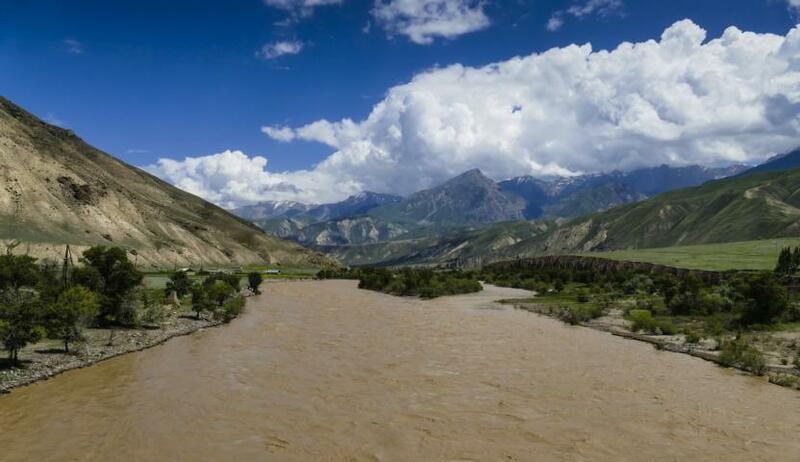 We follow the gorge of Naryn River and drive up to the meadows at some 2500m altitude. 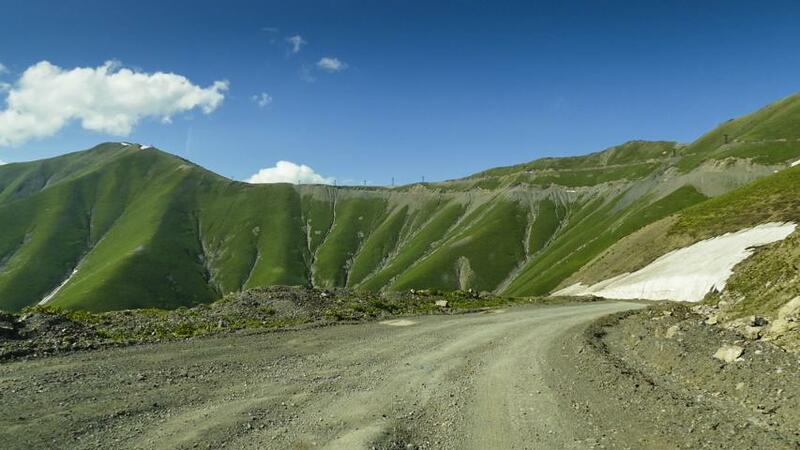 Unfortunately the road going on over Tosor Pass to Lake Issyk Köl is still closed. Too much snow on the top. 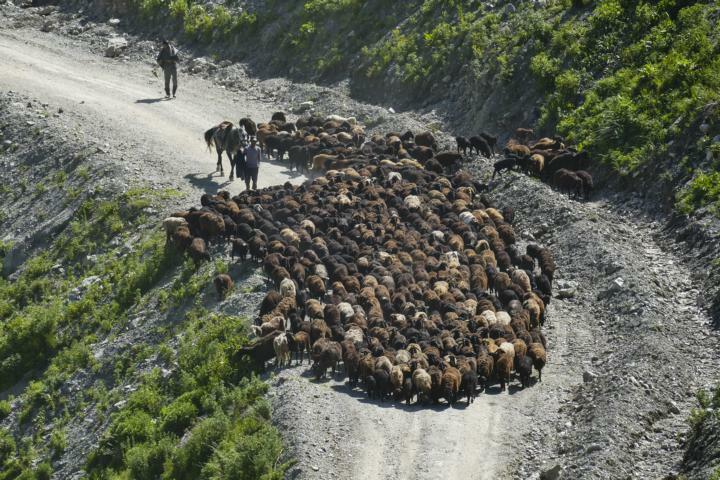 Nevertheless, a valley to observe rural life far off from everything and to see some Yak – these hippie style cows they grow in high altitudes. … on the way some socializing with Russian bikers and a travel agent driving to the Chinese border to welcome 60 cars driving from China to Naryn and wherever… – happy we’ve left this place today. Up to 2800m over a pass, many hairpins and a great thunderstorm on the top. … and then we’re ready for the Kaldama Pass. … in other places we enter in stiff competition with these fat-tailed sheep moving up to their summer meadows. Finally we’re up. 3022m altitude, felt more than 4000. Probably because we started at a quite low level and the road was full of surprises. … a last glimpse of Kaldama Pass and by the evening we arrive in Jalal-Abad some 100km from Osh. We stay in the Hotel Möl Möl. A former Soviet beauty with a huge potential for improvement. But it’s near to an all-important beer garden. And that’s all about. The next day 2h to Osh. A really police infested road. We’re lucky, they didn’t stop us. Nevertheless, a lot of traffic, especially animal transports. 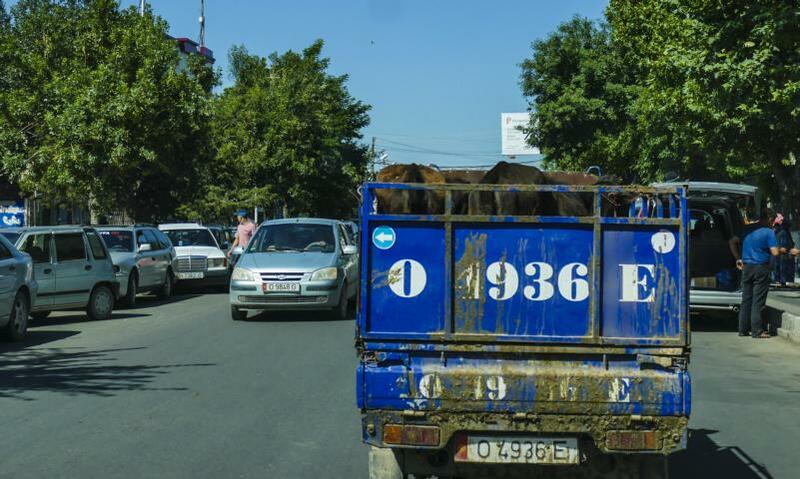 Remains the question whether or not we celebrate the International Cow Transport Day. In Osh, as usual we go to the Tes Gh. Organise maintenance for Prado, meet some other guys on the road to somewhere in the world and develop with the help of a couple of beers all kind of roadside tales difficult to imagine during daytime. The next days we’ll drive to Tajikistan. 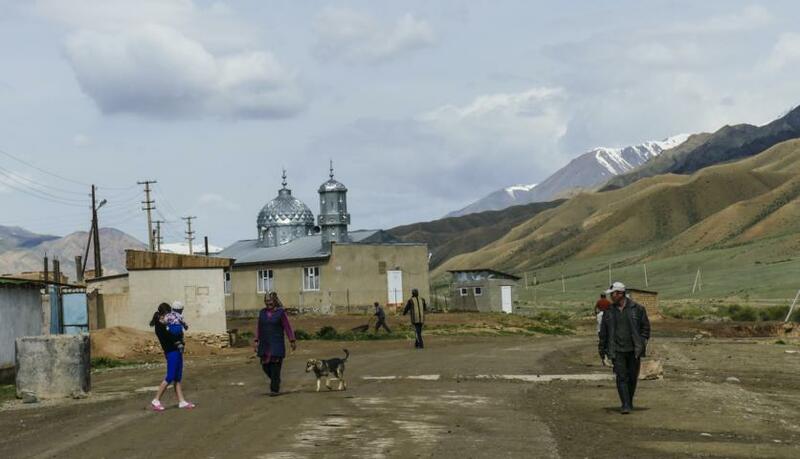 A country known for the famous Pamir Highway and even better known for its non-existent or unreliable internet connection. Kindly be patient, somewhen our next post will be published.